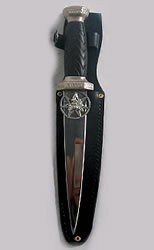 Athame has black rubber grip handle with silver gray trim. Faery and 7 pointed star on hilt of blade. 6" in length, overall length is 9". Comes with black knife sheath.